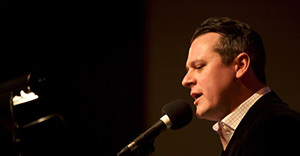 Luke Burbank is a stand-up comic, former NPR host and former producer. In addition to being the lead voice of "Live Wire!," he continues to host his highly successful podcast, "Too Beautiful to Live" (over 2 million downloads/month). Luke's experience with NPR includes "Wait Wait...Don't Tell Me!" in 2006 when he was a panelist and fill-in host, and the morning show "The Bryant Park Project" in 2007 which he hosted. His appearances on "Wait Wait...Don't Tell Me!" have been marked by the audience chanting "Luuuuuuuuuuuuuke!" as the show comes back from a break. Through various other media projects, Luke has also appeared on "This American Life," "All Things Considered," and "Morning Edition." "I think it's pretty rare you get to come in and host something that's already as awesome as Live Wire - usually a show is either dying, or just being born and there's a lot of work to do. Basically, I'm just a stepdad that's coming into an already highly functional family."